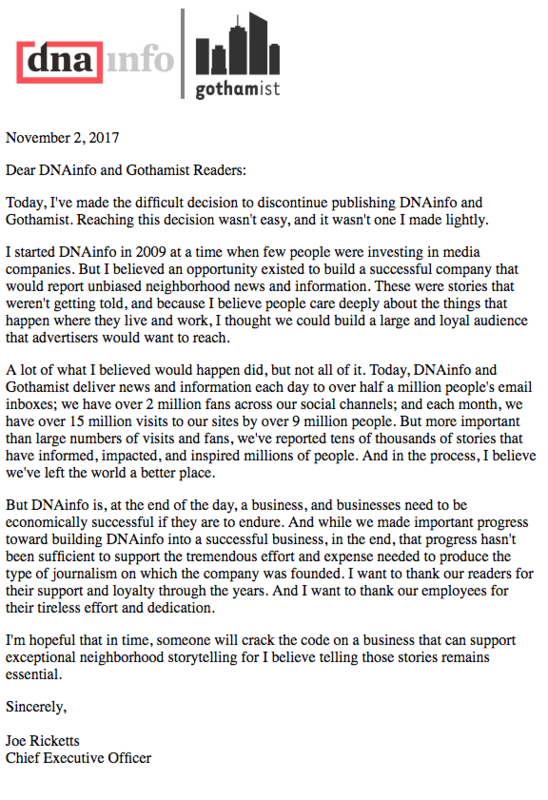 Last November, Chicago’s online local news source DNAinfo — along with The Gothamist in New York — abruptly shut down following speculation of reporters’ attempts to unionize. At 4 p.m. the site was there. By 5, DNAinfo no longer existed. Where had all coverage gone, the hours spent reporting? What would happen to the 60-plus journalists who once scoured Chicago neighborhoods like silent vigilantes? How could other news organizations compete with — and now work to complete — that type of hyper-specific coverage? Enter Block Club Chicago, swooping in like a pen-and-notepad-wielding Robin Hood. Block Club is a nonprofit, digital news organization dedicated to revitalizing the magnifying-glass coverage of Chicago neighborhoods. The nonprofit was co-founded by former DNAinfo reporters Jen Sabella (Director of Strategy), Shamus Toomey (Editor-in-Chief) and Stephanie Lulay (Managing Editor). This past Tuesday, Block Club launched a GoFundMe page, calling on the Chicago community to help support local journalism. “I think us as a nonprofit organization, we are coming out and saying, ‘Listen, all of this money is going to go back into the reporting,'” said Sabella. Within an hour of the page being created, the organization exceeded its initial $25,000 goal. Twenty-four hours, later the group was over $100,000, enough to hire another full-time reporter. As of Friday morning, the group had raised over $125,000. The Block Club Chicago staff will also feature five full-time reporters, including DNAinfo reporters Mina Bloom and Alisa Hauser, with a sixth on the way after reaching their $100,000 mark. Perhaps what is most surprising, though, is the representation of backers. The GoFundMe page has received donations from over 2,000 and counting, with Chicagoans showing their support for a community-based reporting revival. Contributing gifts help seal the deal, too. Block Club offers a free tote bag with $25 donations, one-year subscription and tote bag for $50, and $100 donations including all that plus additional membership benefits. According to O’Keefe, her $50 donation was a worth it in the long run, with a year-long subscription costing less than $5 a month. The tote bag is always a nice bonus. These numbers support an increasing trend in local media — according to an investigation by The Public Newsroom and City Bureau, citizens are more willing to donate to free websites rather than pay to access news. The study also found that “Chicago residents have markedly different experiences with news media depending on where they live,” with North/Downtown residents having a more positive experience with media than South and West Sides. The fundraiser is only on day three, with the offcial GoFundMe page set to close March 8. Block Club Chicago is currently set to be up and running by April, bringing back the transparency that neighborhood-based beats makes possible.